Didn’t we just have snow on the ground? It sure feels like it. But summer in Cheboygan is here and in full swing. June really kicks things off with a couple signature events that help welcome everyone to this great time of year. 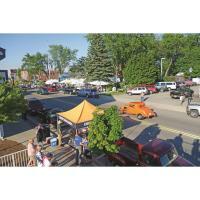 Father’s day weekend will be a hit this year with the newly minted “Hot Cars and Cool Crafts” event coordinated with the cooperative efforts of the Cheboygan Junior Chiefs, the Cheboygan Kiwanis Club and the Cheboygan Area Chamber of Commerce. This is actually two events joined together for one festive weekend. On Friday June 15 the Craft Show in Washington Park opens at 2:00pm and goes until 8:00pm. At 7:00pm the Car Show Participants will parade from the Knights of Columbus Hall on the south side of town, north through downtown and congregate in Yeck's Drive In parking lot. Anyone attending the Craft Show will have prime viewing of the Hot Cars Parade. On Saturday June 16th the events continue with the Car Show opening at 8:00am on Main Street and the Craft Show opening at 10:00am in Washington Park. This year both events will be only steps from each other to allow visitors to easily walk between them. Cheboygan’s big summer festival The Waterways Festival kicks off on the morning of Thursday June 28th this year and continues through the evening of July 1st. This year’s event is scheduled to be the largest Waterways Festival ever with over 35 different events for people to participate in. Some elements to watch for this year include: Disney’s Moana movie showing in Washington Park Thursday evening. Kids Day on Friday will feature games, activities and special guests in Washington Park. Tours of area Light Houses will be available both Friday and Saturday. The US Coast Guard Cutter Mackinaw will be open for tours on Friday and Saturday. The Open Water Challenge International Kayak Race and Great Lakes Downwind Championship is an event not to miss. This race draws professional and semi pro ocean Kayakers from around the world to Cheboygan each year to race from Mackinaw City to the Cheboygan River. This best place to view this race is along the break wall where the Cheboygan River flows into the Straits of Mackinaw at about 3:00pm on Saturday June 29th. The finish line will be the pedestrian foot bridge that crosses the river in Washington Park. Musical entertainment this year includes the Brewhouse Band on Friday Night. Evan Archambo, Virgil Baker & The Just 4 Fun Band and Jedi Mind Trip all take the Entertainment Stage in Festival Square starting Saturday at noon and going into the evening. Sunday July 1st features ship wreck tours and several community worship opportunities all day. The 7th Annual Wooden Boat Show anchors the day at the marina of Pier M33 on the Cheboygan starting at noon. For a full selection of Waterways Festival events be sure to visit www.waterwaysfestival.com. This year is going to be a great summer in Cheboygan! I hope you have an opportunity to get out and enjoy everything that our community has to offer. If you would like more information about anything that we have going on please remember to visit www.cheboygan.com or for Waterways Festival info visit www.waterwaysfestival.com or you can always stop by or give us a call at 231-627-7183.